It has gone up relentlessly for the past year. But the fears of Fed rate hikes have died on slow economic data. 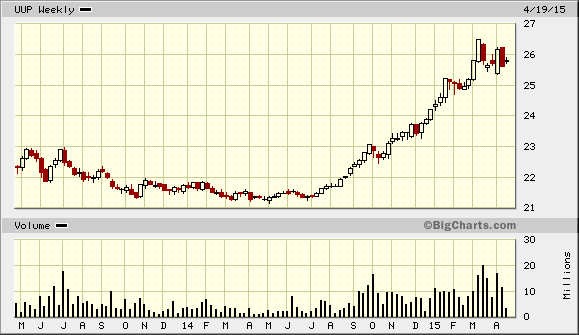 Over the past two months, UPP has put in a lower high and a lower low. This pattern is called a flag formation, which suggests consolidation or reversal. Don't get me wrong — it could move higher here based on slowing growth in China and the possible Greek exit from the eurozone. But at the very least, the uptrend is broken, and you can expect choppier trading from here. At times of extreme currency speculation, I use a simple investment strategy that has paid off handsomely over the years: I find the most undervalued currency located in the fastest-growing economy and buy equity in it. Egypt has a GDP growth rate of 4.3% with consumer price change of 11.5%. Indonesia is growing at 5% with inflation at 6.4%. Poland is at 3.1% GDP with a negative 1.5% consumer price change. Malaysia is growing at 5.8% with a 0.9% consumer price change. India is growing at 7.5% with a 5.2% consumer price change that is dropping — down from 8% last year. Russia, Ukraine, and South Africa are declining or growing marginally with rapid inflation. As investors, we are seeking a discount for value, as well as low inflation and high growth. Looking just at these numbers, Malaysia has the best bang for the buck. That said, it is a major hydrocarbon exporter, and the trend is against it. With an oil price glut, the upside goes to countries that import oil. This leaves you with India and Egypt. Egypt could be a buy. India is the world's largest democracy that just voted in pro-business leadership in the form of the Narendra Modi government. It is arguably the first pro-business government in India's post-independence history. Furthermore, India is a major beneficiary of low oil prices. ...the 55 percent drop in Brent since June to below $50 a barrel is a gift that could give Prime Minister Narendra Modi the room needed to step up infrastructure spending as he prepares the 2015 budget. He estimates the drop in crude is saving India $5 billion a month. The International Monetary Fund added to the euphoria earlier this week by forecasting India will become the world’s fastest-growing major economy by March 2017. The IMF recently came out and said that India's gross domestic product is likely to grow at 6.3% (marginally down from the 6.4% projected in October) in the next fiscal year and 6.5% in the year to March 2017. The Indian Finance Ministry was even more bullish and said GDP could hit 8.5% this year. The World Bank has echoed this idea and said that India's growth will eclipse China's by 2017. Part of this is due to a slowdown in China, and part of it has to do with the slow and chaotic muddling through of the Indian economy. India has a lot of problems, but a centrally planned economy isn't one of them. Totalitarian states can get the trains to run on time — for a while. But nothing beats a free market democracy for price and demand discovery. It looks like a mess, but it works. India has been slowly (and I mean slowly) opening up its markets for the past 20 years. With the new government, change is accelerating, and the payoff is here. The new government is spending money on infrastructure, cutting red tape, and reducing interest rates. The government plans on increasing infrastructure spending from 6% of revenues to 9% with five ultra-mega power projects, as well as new tax-free bonds for roads, rail, and irrigation. ...developing Asian countries have an infrastructure demand of about $8 trillion over the ten years to 2020, including $2.5 trillion for roads and railroads, $4.1 trillion for power plants and transmission, and $1.1 trillion for telecommunications, and $0.4 trillion for water and sanitation investments. Nearly a year into Narendra Modi’s rein, the Indian equity market is no longer the story it was. The benchmark S&P Sensex, up as much as eight per cent at one point during the year, has seen its entire 2015 gains erased. After two weeks of losses, the 30-share index on Friday ended at 27,437.94, slightly below 27,499.42, where it started the year. The index had risen as high as 29,681.77, an all-time closing high, on January 29. With the economy showing little sign of acceleration, the monsoon likely to remain deficient and corporate earnings expected to stay subdued for some more quarters, analysts fear the Indian market could slip further. Worryingly, foreign institutional investor (FII) sentiment towards the market has turned negative over tax uncertainties. Excluding inflows on account of the $3-billion Sun Pharma share sale, FIIs have been net sellers by almost $400 million so far this month. Since 2014, monthly investments by foreign investors have been negative only on two occasions. Also, India is the only major market to have slipped into negative territory in terms of year to date returns. Meanwhile, most European markets are up 20 per cent, China is up 30 per cent and the US market is up about two per cent. Experts said investor sentiment has been hurt by notices served by the income tax department, demanding payment of Minimum Alternate Tax (MAT) on investment by FIIs in the past few years. Nirmal Jain, chairman, IIFL Group, said investors want the tax uncertainty to end and the government should act swiftly in resolving the MAT issue. “We need foreign investment, so we need to boost their sentiment and create an easy, welcoming and participatory environment for them,” he said. The other major stock benchmark, the 50-share Nifty on the National Stock Exchange, after dropping close to 3.5 per cent, ended at 8,305, the lowest since January 2014. “So far almost eight of 10 companies have posted disappointing results. This has been another key issue weighing on the market,” said Chokkalingam. Investors have been spooked as several blue-chip stocks — including ICICI Bank, State Bank of India, Sun Pharma and Hero MotoCorp are down as much as 20 per cent from their 2015 peak. “We see potential correction (fall) in the high-growth quality stocks if investors start questioning the Street’s earnings assumptions. Even with a 15-20 per cent correction, valuations would remain heady,” wrote Sanjeev Prasad, senior executive director & co-head, Kotak Institutional Equities, in a recent note. After the recent fall, the Nifty trades at around 15 times its estimated one-year forward earnings. The valuation is still above its five-year trading average of 14.3 times and also is expensive when compared to the trading multiple of around 13 times for the MSCI Emerging Markets Index. Recently, foreign brokerage UBS cut its year-end price target for the Nifty by four per cent to 9,200 for the Indian market, citing slower than expected recovery in corporate earnings. Four explanations for secular stagnation are distinguished: a rise in global saving, slow population growth that makes investment less attractive, averse trends in technology and productivity growth, and a decline in the relative price of investment goods. A long view from economic history is most supportive of these four views. 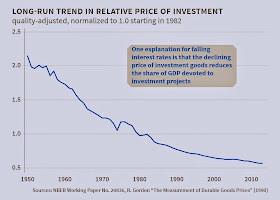 The same investment projects can be pursued, it is hypothesized, by committing a smaller share of GDP, and any additional projects that might be rendered attractive by this lower cost of capital are not enough to offset the decline in the investment share. With less investment spending chasing the same savings, the result can be lower real interest rates and, potentially, a chronic excess of desired saving over desired investment. 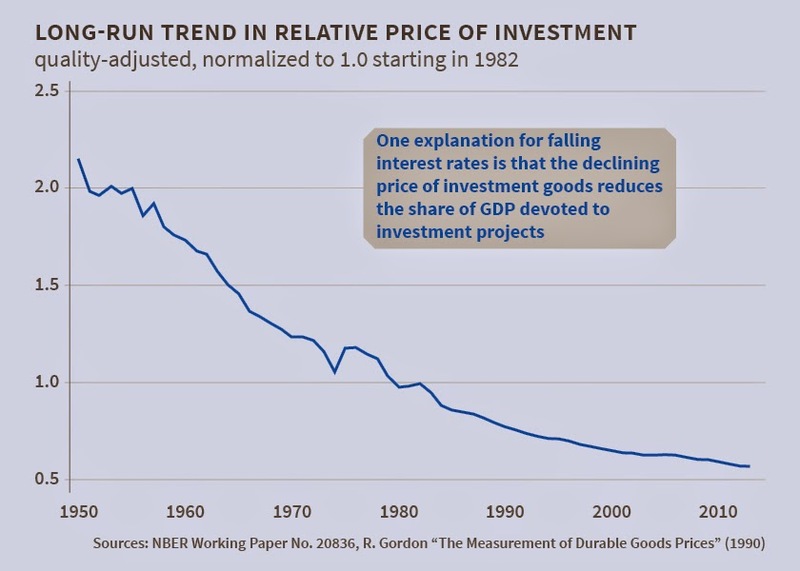 He has this graphic which highlights the declining relative price of investment goods. While this may be true of many developed economies, where the services sector predominates, it may be less so with developing economies. In these countries, manufacturing still makes up a significant share of the GDP and services a less dominant one. This is one more reason for appreciating the international dimension of secular stagnation hypothesis. Once we assume an open economy, the potential for mutually beneficial outcomes from international trade and cross-border capital flows are immense. Last week the Chinese government announced that 57 countries, including India, have agreed to join the Asian Infrastructure Investment Bank (AIIB). The process of preparing the institution's shareholding pattern, governance framework and lending rules will soon start. So what should be India's strategy? Foremost, India should realize that it is second only to China in all the parameters - GDP, population, actual infrastructure investments, financing needs and so on. But the politics and economics of joining AIIB pulls in different directions for India. Politically, it is undoubtedly in India's interest to not to be not part of the founding of an institution which now holds some global geo-political significance. India should aspire to a seat at the top of the table in an institution that has the potential to become one the leading multilateral financing institutions. But economically, India could well stay out of AIIB and not lose much. Its infrastructure investment needs are massive, nearly $ 1 trillion targeted for the 2012-17 period. The AIIB's contribution can, at best, be just a drop in the ocean. In fact, given its modest initial capital ($50 bn) and the perception discount (among investors and countries) associated with an institution that is clearly dominated by China, one could argue that economically the institution would benefit more from India's presence than India would. It is therefore safe to argue that the AIIB needs India atleast as much as India needs AIIB. India needs to leverage this to its advantage as it negotiates the Articles of Agreement (AoA) of the AIIB. It should not become just another invitee to a Chinese triumphal party. Given the deep Chinese interest in displaying how the new institution will be fairer and more equitable than the Bretton Woods twins, India has the opportunity to play ball with China over negotiations on the AIIB's governance framework. Furthermore, given China's dominance in AIIB (its initiative, headquarters, leadership position etc), a framework which is fairer and more equitable than the Bretton Woods institutions would involve considerable sacrifices by China and gains for countries like India. Apart from the limited financing opportunities, what should be India's possible takeaways from an AIIB? 1. India should push the AIIB away from multilateral sovereign lending and towards project finance lending. A country like India should have limited interest in sovereign loans and should be more concerned about using all potential sources to leverage international long-term capital to finance its, predominantly, privately financed infrastructure projects. For example, like with the case of World Bank and IFC, even a small AIB share in a project could serve as a credit enhancement and help crowd-in international capital at lower cost than otherwise. 2. India should advocate issuance of bonds by the AIIB in not just dollar and renminbi (as is most likely, since China would not lose this opportunity to promote the renminbi as a reserve currency), but also rupees. This would help in the internationalization of the rupee as well as help Indian borrowers more cost-effectively hedge their losses and thereby lower the cost of their foreign capital. 3. India should strive to use the AIIB as an instrument to promote the interests of its own infrastructure firms. It should not be a surprise if China uses the cover of AIIB lending to promote contracts for Chinese firms. There is a strong likelihood of this given the perception that China could use the AIIB to formalize the massive lending currently being undertaken by institutions like the China Development Bank, all of which are conditioned on awarding contracts to Chinese firms. In that case AIIB could become an extended arm of Chinese aid diplomacy. Instead, India should negotiate hard to ensure a level-playing field for Indian firms. 4. The bonds issued by the AIIB could be a potentially good source of risk diversification as well as earning higher returns for India's growing foreign exchange reserves, a large share of which are currently invested in low-yielding US Treasuries. In fact, India should use its reserves and unilaterally match any Chinese contribution either by subscribing to bonds or equity capital.